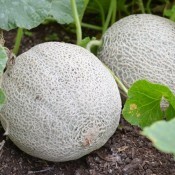 Melons are members of the large family of gourds or pumpkins, which grow on trailing vines. There are thousands of varieties and range in size. Melons are considered to be a fruit, but are often used as a vegetable. The wild ancestors of this species seem to have been native to the region stretching from Egypt to Iran and northwest India. Melons fall into two main categories: summer fruits, which include all those varieties with netted rinds; and winter melons, which have a smooth or finely ridged rind that is smooth or finely ridged. Melons make great patio climbers, but they do need some support as they grow. Otherwise, they can be left to grow as a ground-cover crop through ornamental beds and borders. They grow best in full sun in a warm location. The soil should be average to fertile, humus-rich, moist and well draining. Fruit develops poorly with inconsistent moisture and plants can rot in cool or soggy soil. To improve drainage, use raised beds or mound soil up before planting. Melons bear male flowers first. Female flowers will usually appear a week after and tiny melons will form just below the base of the flower. They prefer plenty of water during the growth and early fruiting stages. As the fruit is ripening, cut back on watering, the fruit tends to be more flavourful and sweeter. 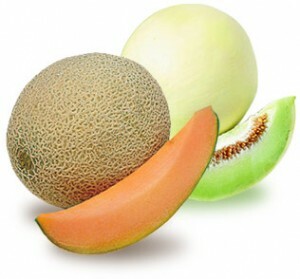 Melons have very high water content, therefore, low in calories. The more orangey the flesh, the more carotenes it will contain. They are high in vitamins A and C; fair source of folacin, vitamin B, magnesium and other minerals. 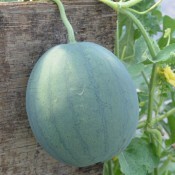 Generally, melons do not become sweeter after harvesting so they should be allowed to fully mature on the vine. Cantaloupes develop more netting on the rind as they ripen. They “slip” easily from the vine with gentle pressure when ripe, meaning that the vine naturally detaches from the fruit.